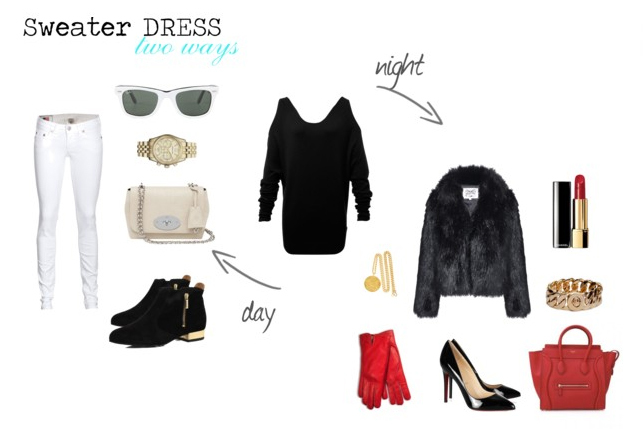 One of my winter wardrobe staples is a sweater dress. Why? Because it is a real multitasker that will never go out of fashion. You may remember I posted about it (here) previously. Before that post, that grey dress was serving sometimes as a work dress worn with a jacket or as a dinner date dress if paired with statement accessories. So when I was approached by a newly created Australian online boutique, Jour Et Nuit to pick an item from the store and style it – the choice was easy – Otto Mode Lauren sweater dress. It is a definite must have! Additionally, Jour Et Nuit has kindly provided a 15% discount code for ALL of CrashingRed’s readers. Simply enter CRASHINGRED (case sensitive so it has to be in capitals) when you make a purchase. Winter? Right now it´s summer in Europe okay doesn´t fell like summer. Like your picks a lot but I´m not really longing for winter to come. too waesome darling lady! love the looks, i think my fav one is the day look…although give me celine any time of the day and i’m sold. hope you’re having a week as beautiful as you!